Netbook killer. The battery life of a netbook with the performance of a subnotebook. Could the dream be realised for just €329? This 10.1-inch, AMD-based machine begins the assault on Intel’s Pine Trail netbooks. Its weapons: Athlon II Neo, DDR3 RAM, ATI HD 4225 and HDMI. 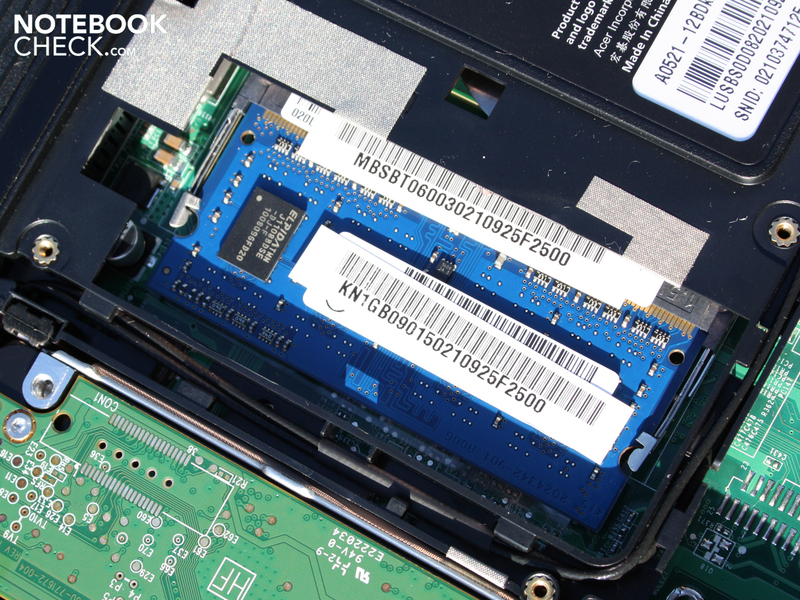 Since the start of 2008, Intel-based netbooks have been making a name for themselves in the laptop market. The 10-inch machines may offer very little in the way of performance, but they have long battery life and are very inexpensive. For only €260, consumers are well able to afford a small secondary notebook for surfing from the sofa. 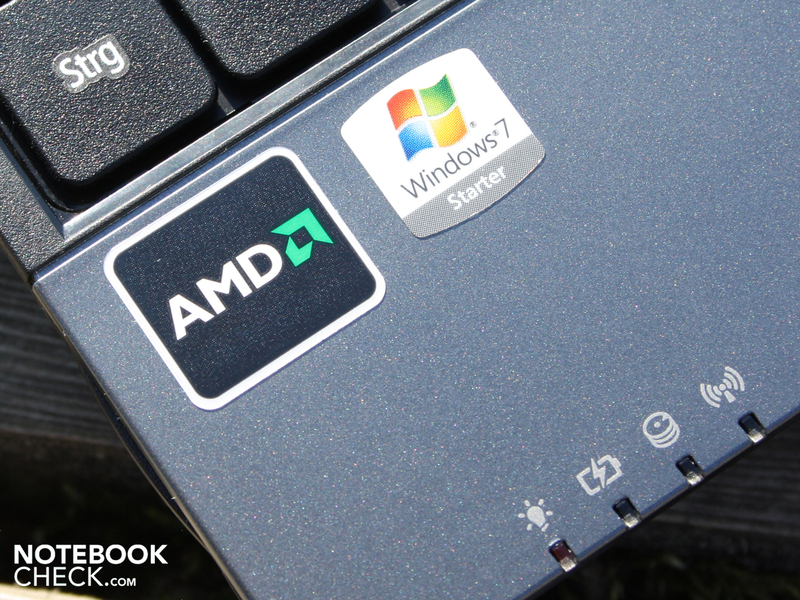 But thus far, chip manufacturer AMD has not been able to profit much from the netbook boom. Virtually all netbook manufacturers have been relying on Intel’s netbook platforms, quite understandably. 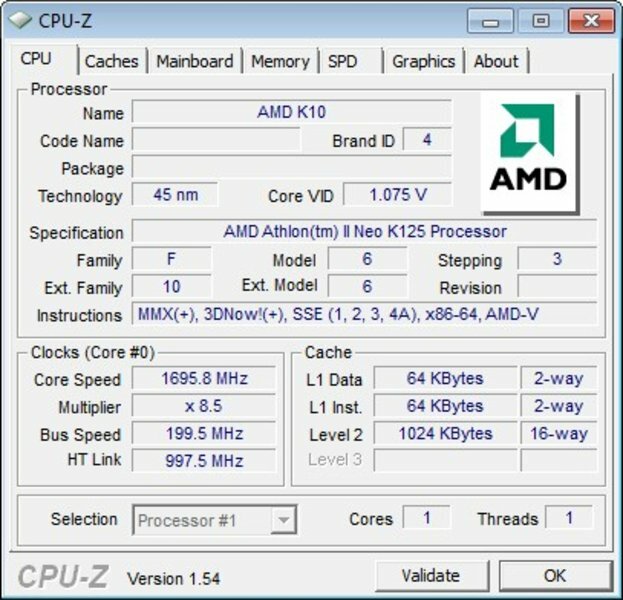 AMD-based machines like the Medion Akoya E1311 (AMD Sempron 210U) or the Asus Eee PC 1201T (Athlon Neo MV-40) are exceptions to the rule. The reason is this: the power consumption of the processors was so high that the netbooks had a two to four hour battery life at most. This simply cannot compete with Atom-based machines, which achieve real-life battery run times of from five to eight hours. Now AMD has managed to enlist Acer for its fightback against Intel. 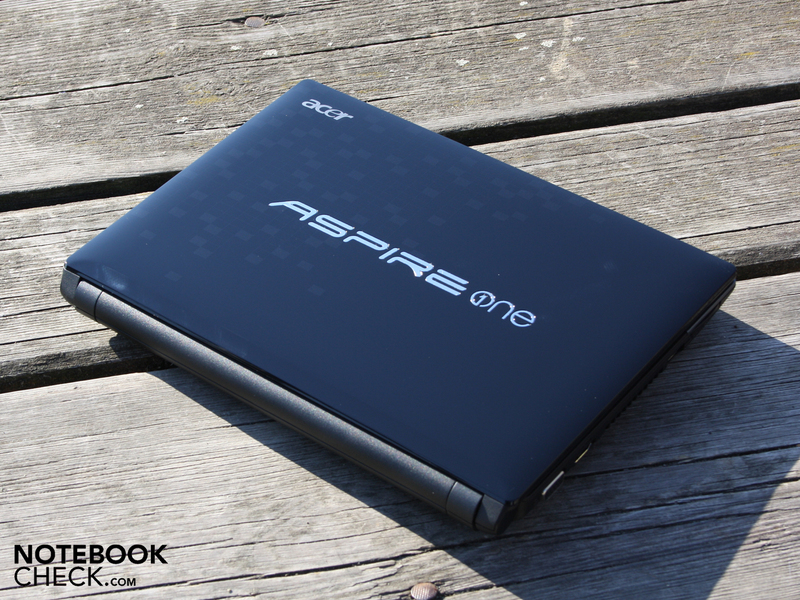 Acer has provided a completely new case and graced it with the name of its quintessential mobility product, the Aspire One. Inside is the Athlon II Neo, a ULV processor based on AMD’s Nile platform, as well as an ATI Radeon HD 4225. 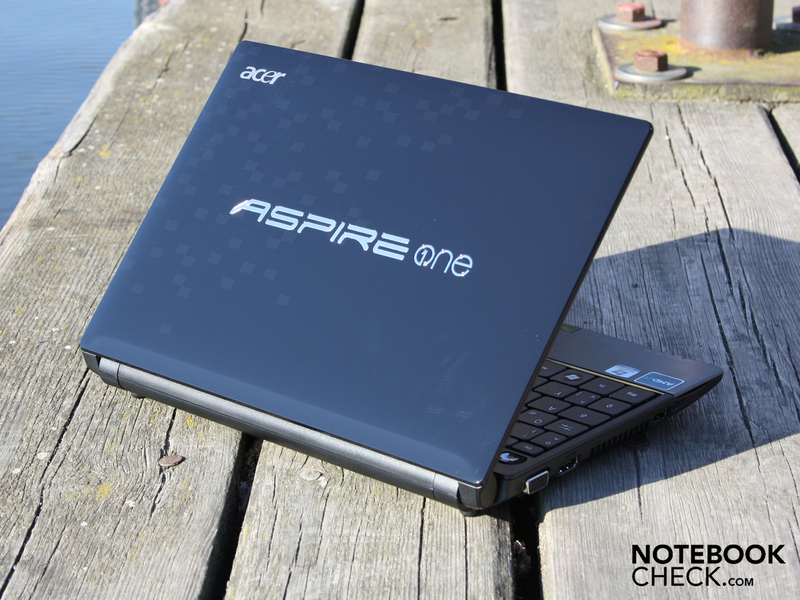 Can the Aspire One 521 become the advanced guard for AMD’s new wave of netbooks? We like its chances. Get all the details in our review. 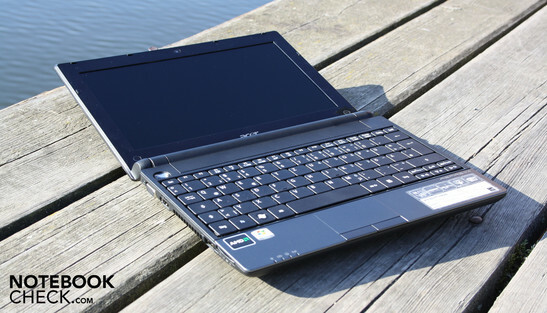 The case that Acer has constructed for the Aspire One 521 is completely different to the case of the Aspire One 532, the Pine Trail netbook. The base unit and lid are more angular, the hinges are positioned more to the side and the lid has completely different lettering on it. 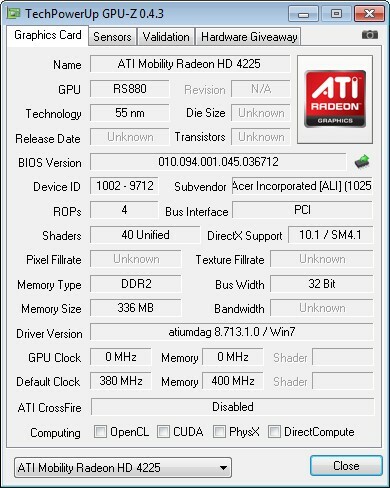 But this should not be a disadvantage to the AMD netbook, as it helps distinguish it clearly from the 08/15 Aspire One. The plastic case impressed us with a surprising level of robustness. Even using both hands and a considerable amount of force, we weren’t able to make the chassis flex noticeably. The lid, the top of the base unit, and the underside of the netbook all withstood our pressure admirably. Under the keyboard is an aluminium plate which is attached to the motherboard beneath with countless screws. The motherboard takes up the whole breadth and height of the case, which makes it very stable. 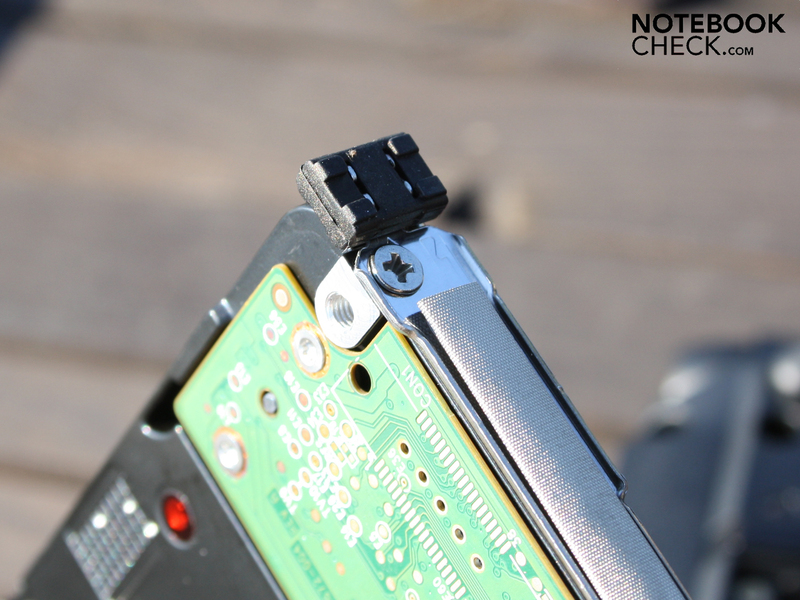 The underside of the netbook takes the form of a tray (left) which houses the motherboard; the tray is fastened with numerous screws to the upper pieces, including the aluminium plate. You can’t make the thinnest netbook in the world with such a structure, but the netbook’s rigidity is remarkably good. This also holds true when the battery is removed. The screen can be opened to almost 180°, making it easier to read documents and websites when travelling. 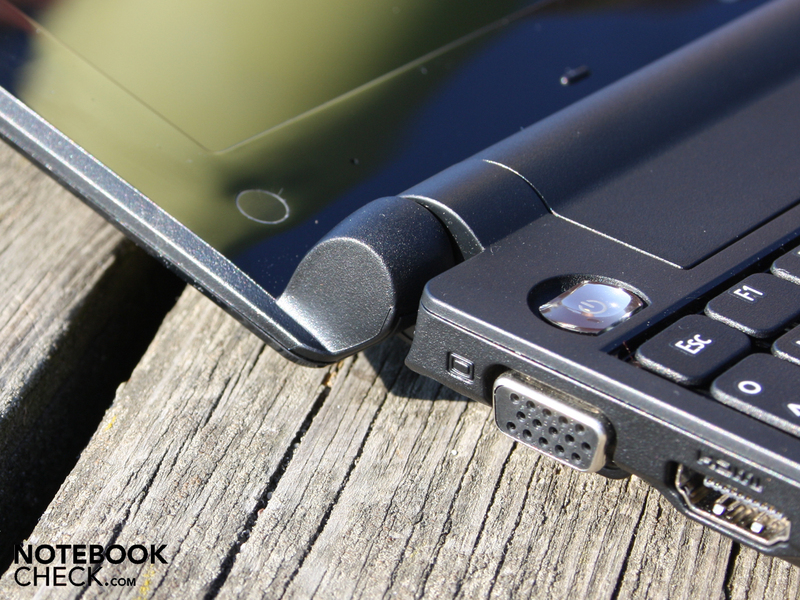 The angled hinges mean that the screen sits at the back. The lid is nice and strong with its broad screen edging. However we are not too keen on its glossy finish; it quickly gets covered in greasy fingerprints. But Acer has given this some consideration and has provided a cleaning cloth. 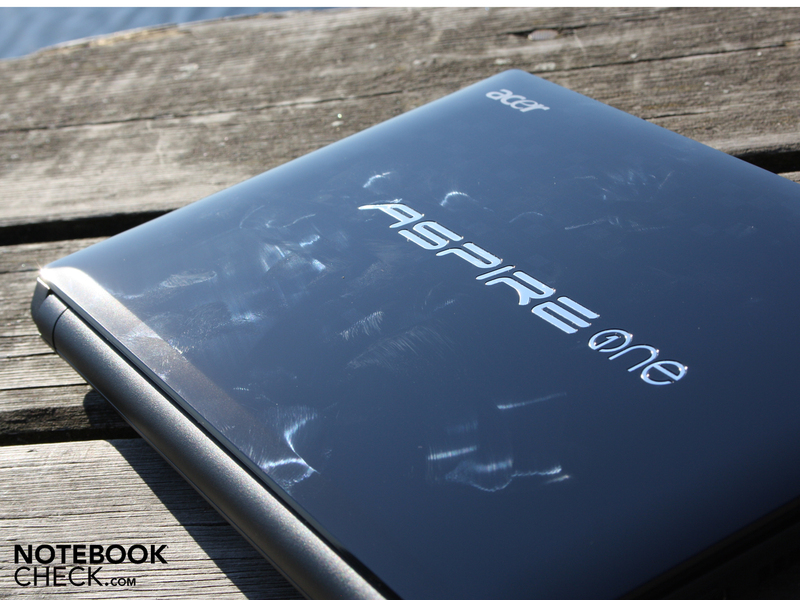 Otherwise the lid has a high-quality appearance with the Aspire One logo etched into its surface. 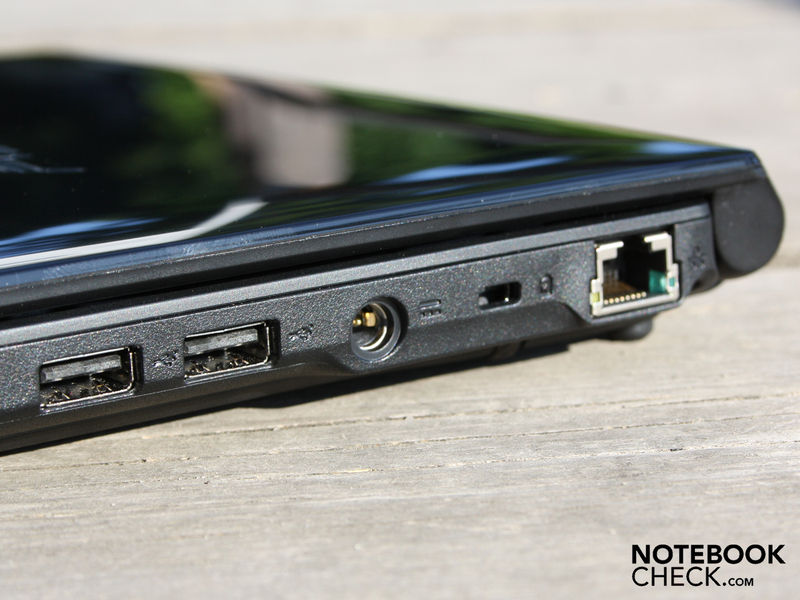 Netbooks generally have the same spartan selection of ports. But this is actually not true of the Aspire One 521; along with the standard ports it also offers HDMI output (video and audio, HDCP support), a connection which is made possible by the ATI HD 4225. 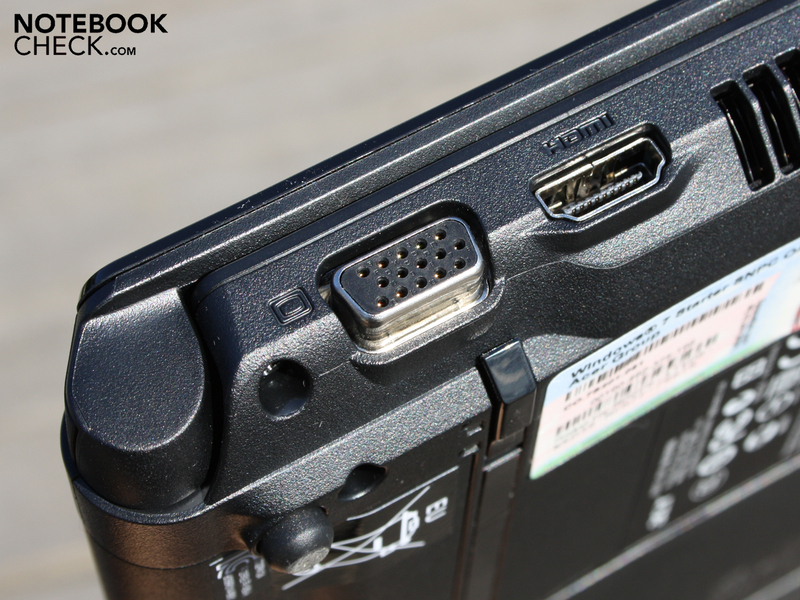 Simultaneous VGA and HDMI video output is not possible; not least because Acer has positioned the VGA and HDMI ports extremely close together. Our HDMI and VGA cables would not fit in side by side, however forcefully we tried to insert them. So we could not even test whether the HD 4225 can produce simultaneous analogue and digital signals. 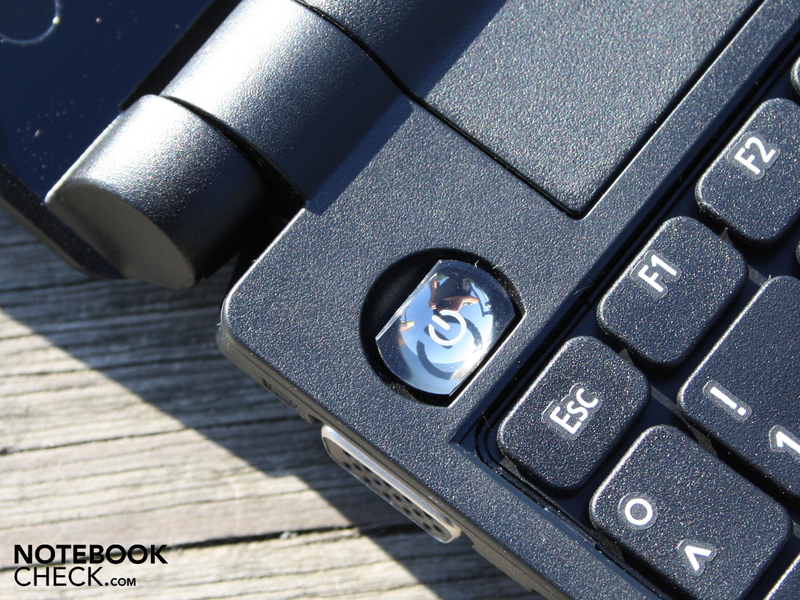 Other than that, you get the usual netbook fare: three USB 2.0 ports, a card reader and two audio ports. The ethernet card (Atheros AR8152) only offers Fast Ethernet, but the wireless module (Atheros AR5B95) uses the fastest draft-N standard. The Bluetooth 3.0 +HS (high speed) module is a minor highlight; in contrast to 2.1 +EDR (enhanced data rate), this Broadcom module has an additional high-speed channel. This should allow a data transfer rate of 24 Mbit/s (code name: ‘Seattle’ release). 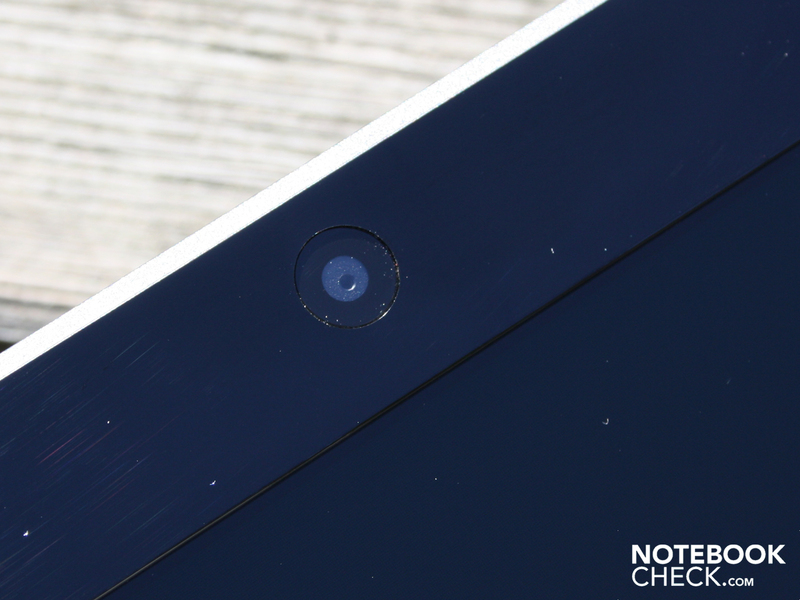 The inconspicuous-looking webcam can take photos with a 1,280x1,024 resolution (4:3). This is a relatively high resolution. Samsung netbooks, for example, only have a VGA resolution (640x480). The webcam can record videos in VGA quality. The biggest problem with typing on the Aspire One 521 is not the small keyboard but the narrow palm rest area in front of it. 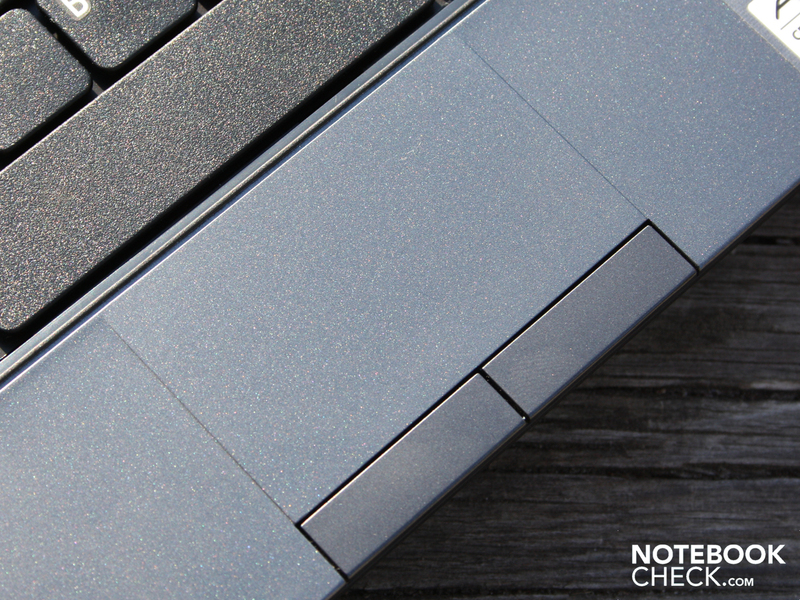 Larger hands will keep slipping down over the hard front edge of the netbook, having nowhere to properly rest. The keys themselves do not have much travel and do not respond very firmly, but thanks to the aluminium plate under the keyboard there is at least a firm point of impact at the bottom of the stroke. The keys are very close together. The raised markings on the F and J keys for touch-typing are prominent and easy to find. The arrow keys have certainly been shrunk too much, as well as the page up and page down keys. If you are trying to use these keys quickly you will often find that the cursor has jumped to somewhere unexpected. Overall the feel when typing is rather laboured, without good tactile feedback. 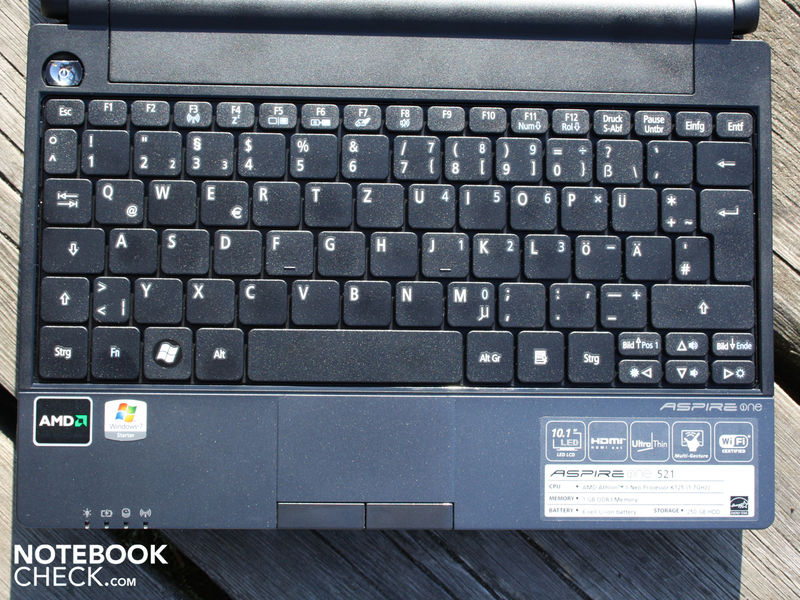 Users will grow accustomed to it, but we have definitely seen better netbook keyboards (for instance the Samsung N220). The multi-touch pad from Synaptics (V7.2) offers a lot of different options for customization. For instance if you don’t like scrolling with two fingers you can simply switch it off. You should then activate the touchpad’s unmarked horizontal and vertical scrollbars, so you can still scroll through websites and documents. The surface of the pad is not particularly large, but seems to be sufficient. It is sensitive right up to its borders. The touchpad has the same smooth feel as the surrounding palm rest area; it might be a little too smooth for some users. 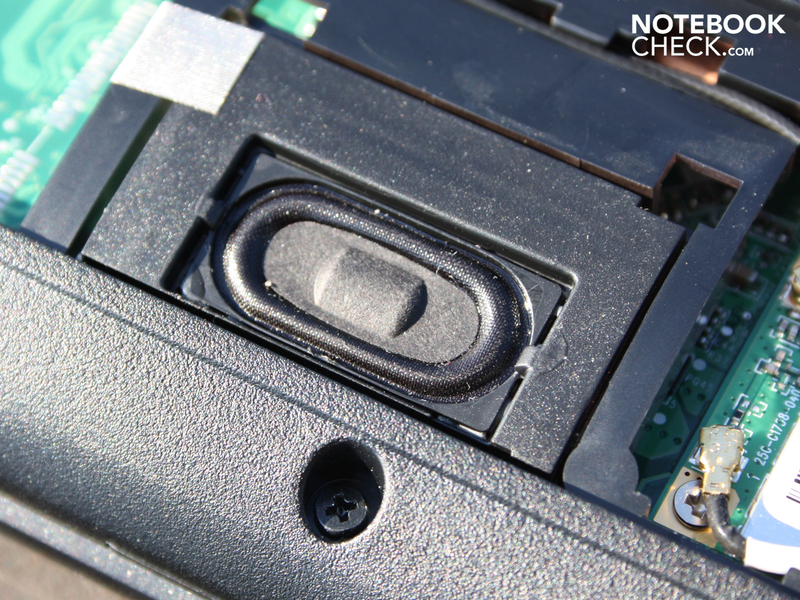 The touchpad buttons depress to a clear depth, but unfortunately make an uncomfortably loud 'click' when pressed. It will quickly get on the nerves of the person next to you in the lecture theatre. The 25.6cm (10.1-inch) screen has a native resolution of 1,024 x 600 (WSVGA), which is standard for a netbook. This is a shame, as the onboard HD 4225 graphics chip can handle HD-ready (1,366 x 768) and Full HD videos. An HD-ready panel would have provided a much clearer picture overall. There are 10-inch netbooks with higher resolution screens, like the Dell Inspiron Mini 1012 for example. But, the Aspire One’s price of €329, already rather high for a netbook, would have had to have been higher still. The screen’s contrast is quite acceptable; the glossy display has a contrast ratio of 281:1. The contrast ratio describes the difference between the strongest black and the strongest white that the screen can produce. Colours do not look particularly spectacular on the AUO display (B101AW06 V1), but they are vibrant enough. Compared to matt screens with low contrast like the Dell Latitude 2110 (contrast ratio only 160:1), the Aspire One 521 has nothing to be ashamed of. The glossy finish enhances the visual impact of the colours. 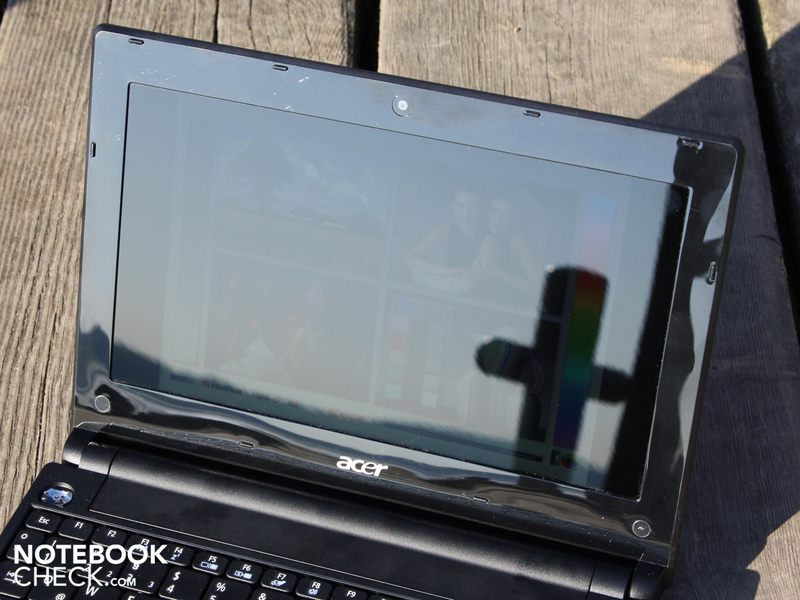 Acer call this a High Brightness (200 nit) display with LED backlighting. We measured the brightness to be exactly that, at an average of 198 cd/m². 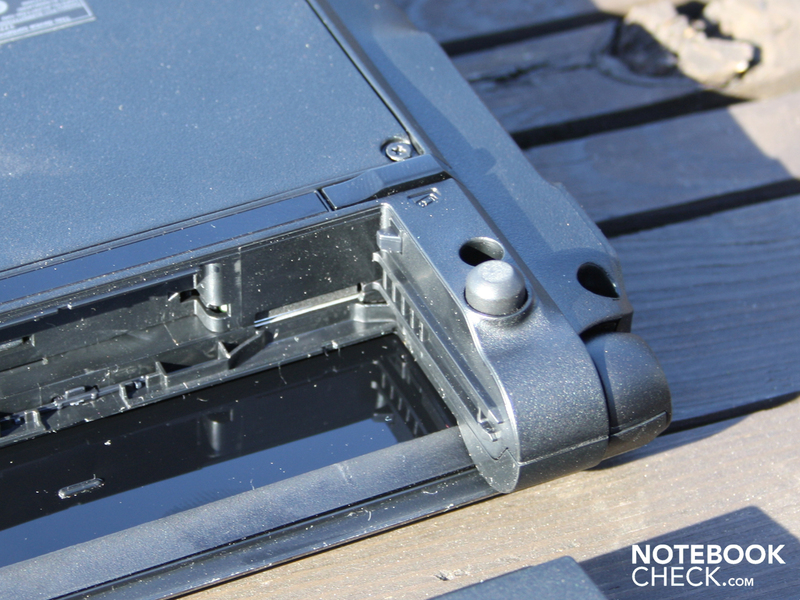 We would have preferred to see a brighter screen on a netbook, at least 250 cd/m². The distribution of brightness is quite acceptable, but not perfect, at 84%; a very attentive user could start to distinguish darker and lighter patches (on a fully black screen). In the bottom-right segment the brightness drops as low as 180 cd/m², while in the top-left segment we measured 215 cd/m². The glossy screen may be good for colour reproduction, but it is disastrous for outdoor use. All sorts of background objects are reflected on the screen, including the user. The brightness of 198 cd/m² is just not strong enough to counteract reflections; you would certainly have to find a shady spot if you want to work outside and still see the screen. The varnished screen bezel behaves just as badly outdoors. It collects fine dust particles like the screen itself. The cleaning cloth should not leave your side; when fingerprints and dust combine, even the laziest netbook owner will feel compelled to use it. The Acer netbook’s viewing angles are very good in the horizontal direction. Text is readable up until about 60°, and colours are hardly inverted at all. But vertically the observer can only deviate by 10° (from below) and 25° (from above) before the picture darkens or lightens and colours invert. 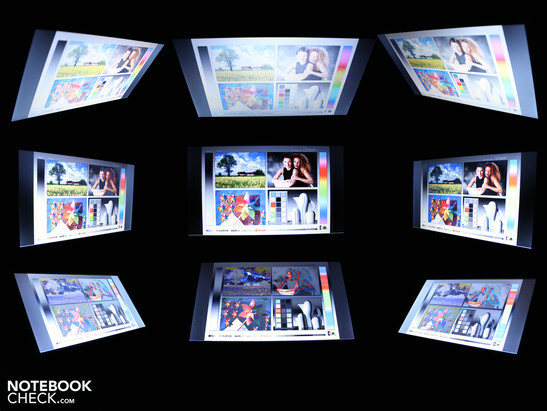 Anyone looking at the display from the side and from below will see terribly inverted colours. But angled views from above are quite tolerable. 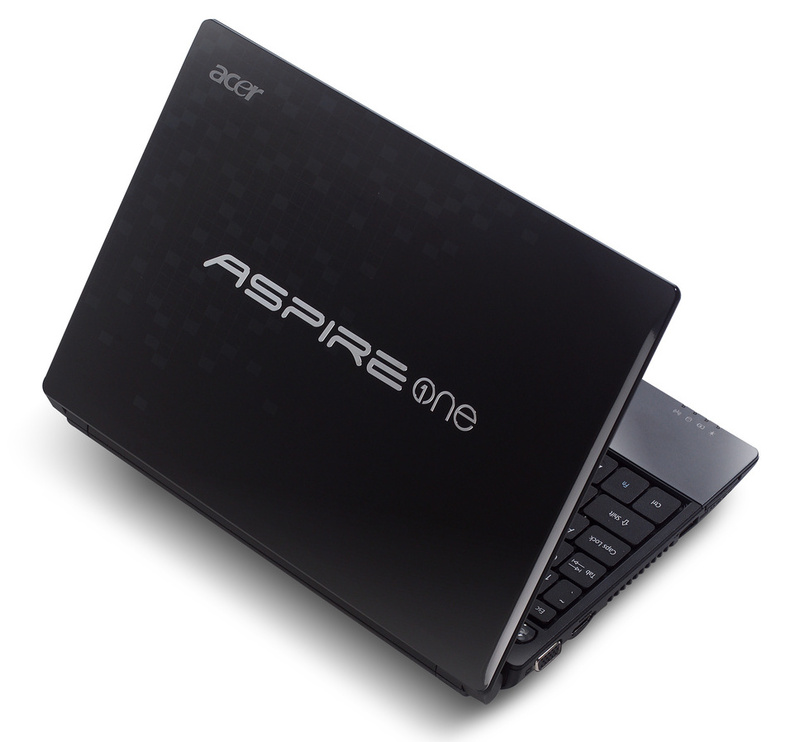 The Aspire One 521 is powered by an AMD Athlon II Neo K125 (1.7 GHz, 45nm). 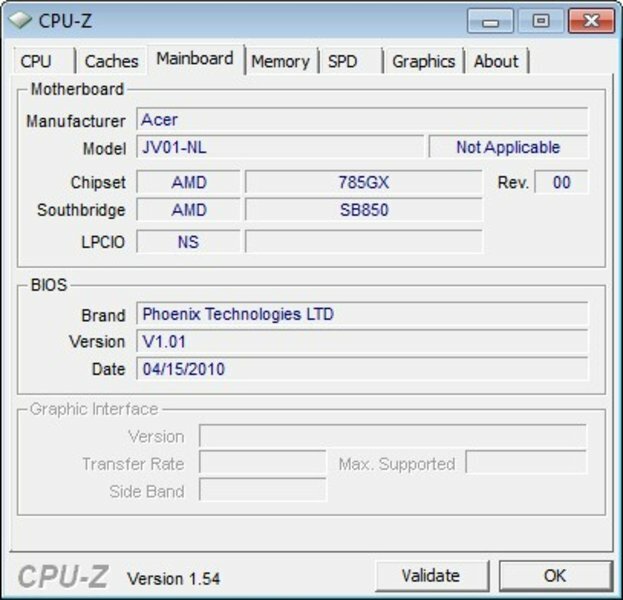 This processor is based on the manufacturer’s mobile Nile Plattform, which was only officially released in April 2010. Along with it comes the AMD chipset 785GX, which allows you to have 1,024 MB DDR3 memory (PC3-10700, Elpida). DDR3 is more energy efficient than the DDR2 which is typically used in netbooks, because it operates at a lower voltage. The single-core processor has 1 MB of L2 cache and a thermal design power (TDP) of 12 Watts. It supports a 64-Bit mode, so the 32-Bit Windows 7 Starter operating system is holding it back a little. The Aspire One 521’s integrated graphics processor is an ATI Radeon HD 4225 with its own 348 MB of sideport memory. It includes a video decoder (UVD 2) which supports the K125 in decoding HD videos (MPEG-2, H.264, VC-1). The IGP is Direct X 10.1-capable, which sounds good, but does not play much of a role given the netbook’s poor gaming performance. The 3DMark2006 benchmark (1,280 x 1,024) finished on 1,046 points; Nvidia Ion netbooks get a similarly low score of 1,150 points at the same resolution (see for example the Asus Eee PC 1201N or the Samsung N510). The AMD Athlon II Neo K125 works faster than an Intel Atom. Pure CPU benchmarks indicate the K125 processor (1.7 GHz) is up to three times as fast. 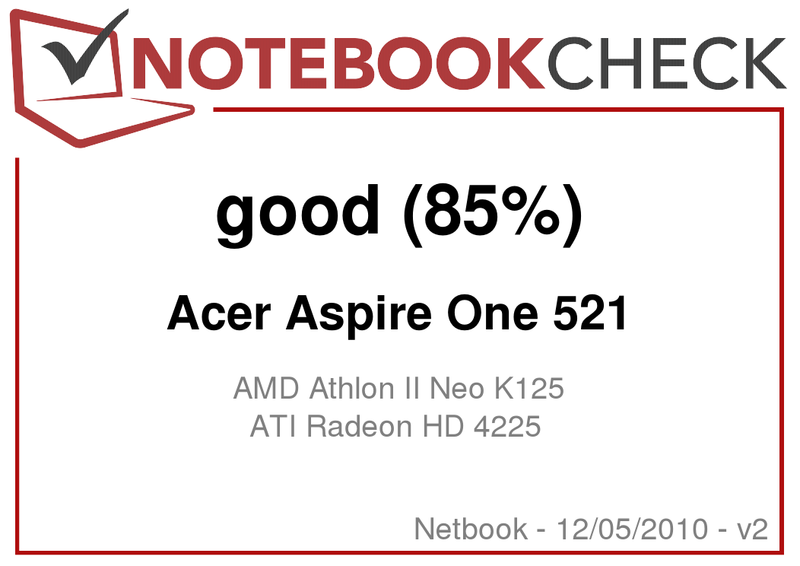 While an N450 netbook only scores a lowly 550 points in the Cinebench R10 Single test, the K125 scores a convincing 1,491 points. In the shading test, which uses the graphics card to perform a calculation, the AMD system achieved 1,822 points; whereas Pine Trail with its weak GMA 3150 only manages 290 points. Our Cinebench graphic (click on ‘...in comparison’) shows how the AMD netbook has reached the same level as an Intel Core 2 Solo SU3500 (single core) or Core 2 Duo SU9400 (dual core). 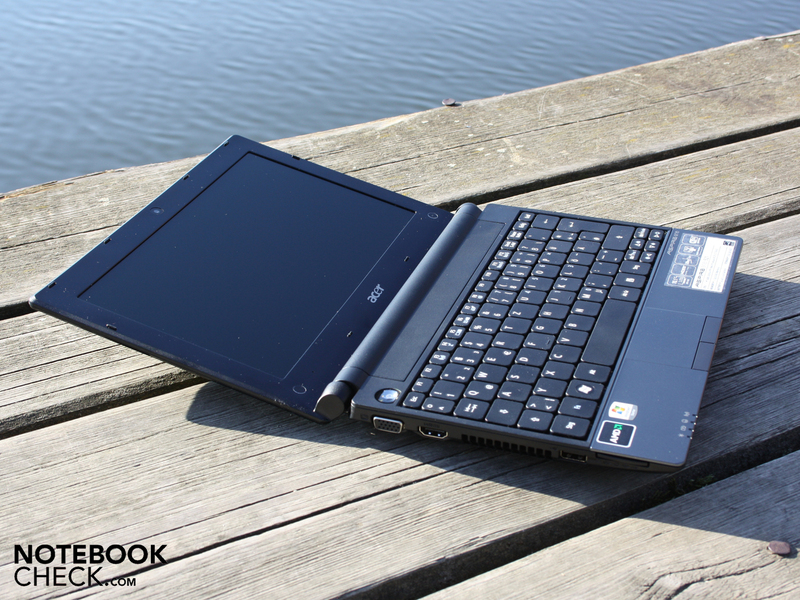 The netbook has closed the gap on its superiors, achieving the performance level of a simple subnotebook. How much of this is down to the DDR3 memory? The PCMark Vantage memory score is 1,157 points. 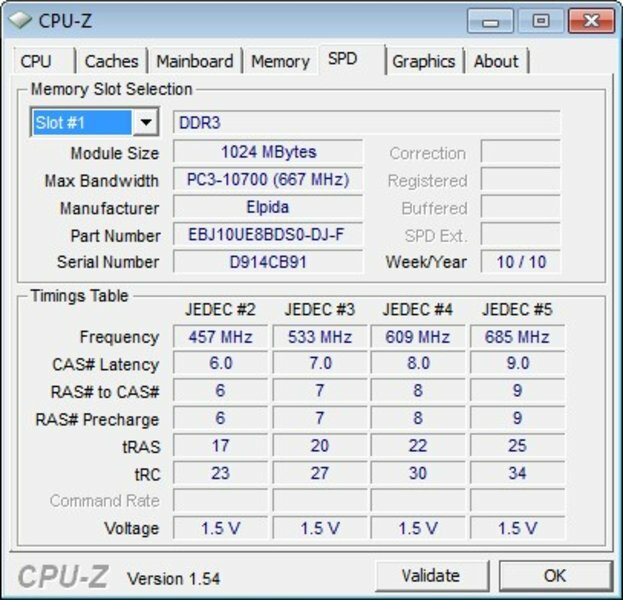 Intel netbooks with DDR2 memory achieve only 429 points (e.g. Samsung N150 Eom). The higher performance level of the AMD processor and DDR3 memory mean that the netbook feels fluid and fast to work on. Two installations running simultaneously along with music in Media Player does not have us tearing our hair out. We can also open other applications at the same time. This brings CPU usage up to 67%. However, the installs took three to four times longer they would on a Core i5 laptop. What does PCMark Vantage, a performance test for the whole system, have to say? Intel-based netbooks and also Nvidia Ion 2 systems do not acheive more than 1,400 points here; for instance the Asus Eee PC 1201N (Ion 2: 1,368) and the Samsung NP-N150 Eom (N450: 1,332). The Aspire One 521 can improve on these results, hitting 1,686 points. The higher memory score (DDR3) and the better gaming score (HD 4225) both play their part in the better performance rating of the AMD system. 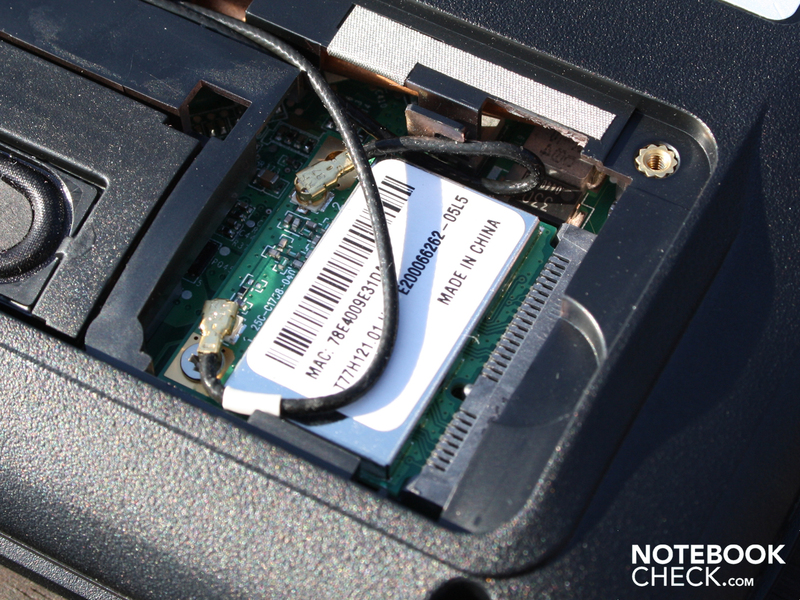 As the CPU benchmarks have already shown, the Aspire One 521 is on a par with a simple subnotebook. A Samsung X520 (Intel Core 2 Solo SU3500) scores 1,674 points. 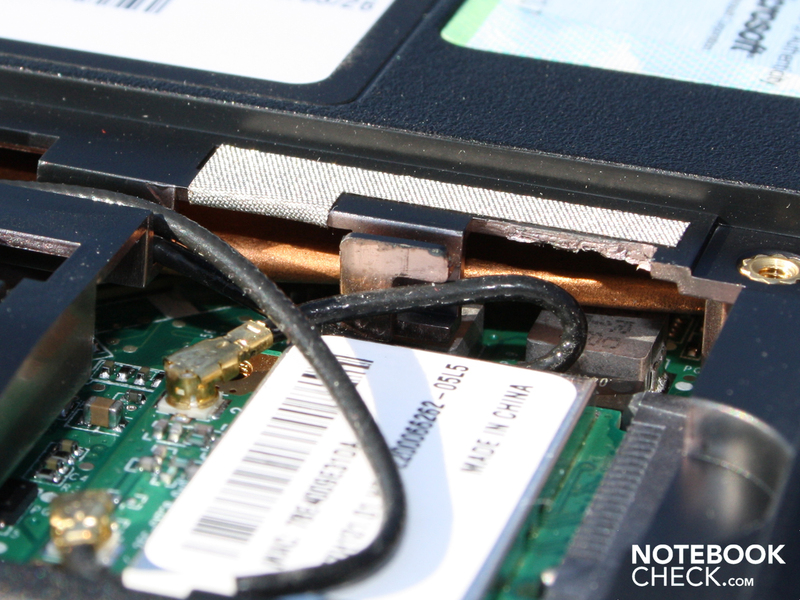 A Lenovo IdeaPad U350 (Pentium SU2700) scores 1,471 points. The Western Digital hard drive (model type WD2500BEVT-22A23) with 250 GB did not achieve a high throughput rate on the HD Tune test. 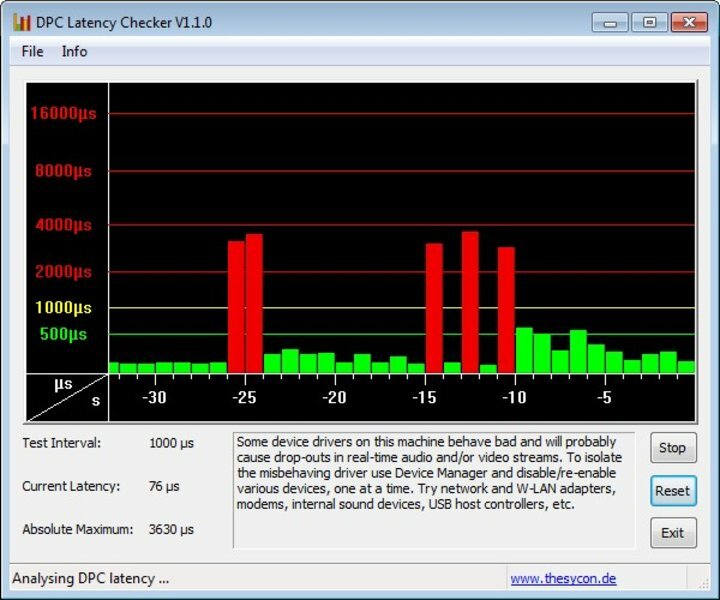 54.9 MB/s in the sequential read test is below average for a 2.5-inch laptop hard drive. But the hard drive is practically inaudible even when the reading and writing heads are very active. It is tempting to make a comparison with the Nvidia Ion (GeForce 9400M), as it has been the strongest IGP in the netbook so far. The GeForce 9400M achieves a frame rate of 30 fps in the Crysis benchmark, while the ATI HD 4225 only manages 19 fps (at 1,024 x 768, low details). The Ion scores 1,150 points in the 3DMark2006 benchmark; the HD 4225 gets only 1,046. In the first-person shooter Left 4 Dead the Ion can produce 64 fps, but the HD 4225 only 26 fps. And World in Conflict runs at 15 fps on the Ion, and just 4 fps on the HD 4225 (1,024 x 768, medium settings). 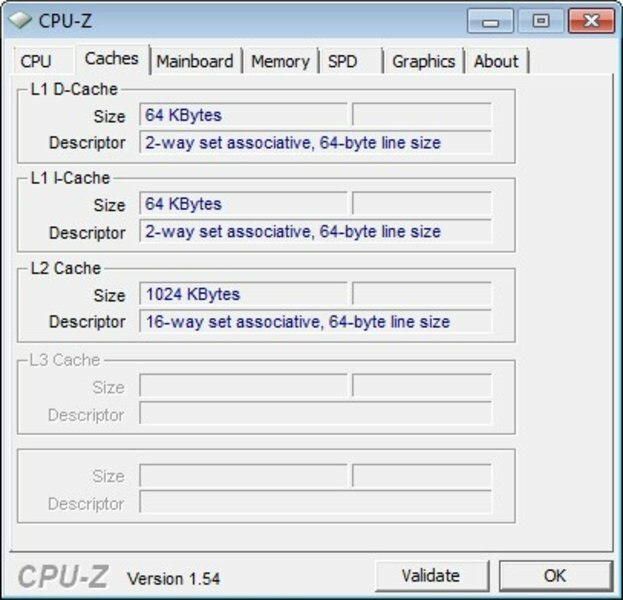 However, the comparison is not really fair, as the above-mentioned games were all tested using an Intel Core 2 Duo processor with the Ion system. We don’t have the appropriate data to make a proper comparison with an Atom-based Nvidia Ion system. 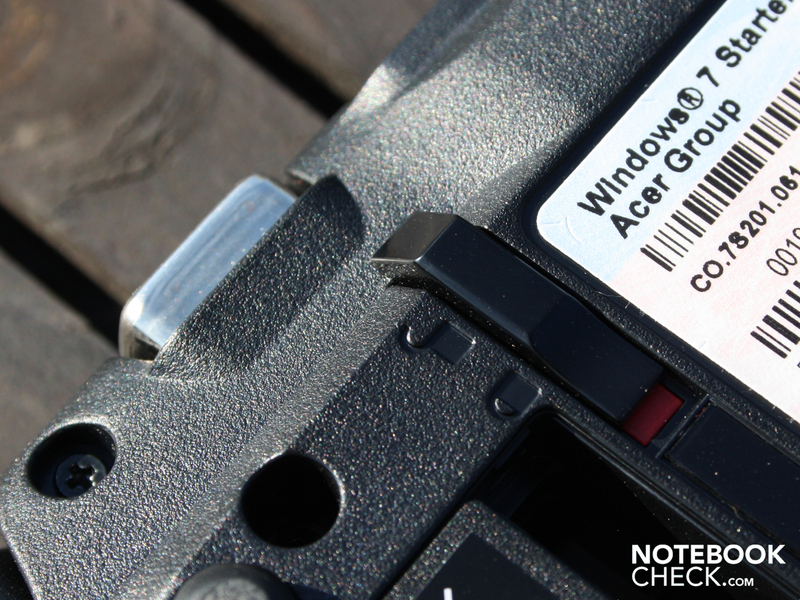 We also lack the gaming data for a full comparison with Intel Atom + GMA3150 netbooks. But the 150 points that they achieve as standard in the 3DMark2006 benchmark (1,280 x 1,024) speaks such volumes, that we can save ourselves the trouble of installing Crysis and the rest. With a 3DMark2006 score of 1,046, the HD 4225 is clearly more powerful. Will games run on their lowest settings? We insisted on testing out a few games on their lowest resolution and detail settings. Left 4 Dead: Hunting zombies is fun. With the lowest possible resolution (640 x 480) we managed to get an almost-smooth frame rate of 26.3 fps. Occasionally explosions cause brief periods of jerkiness. At the native resolution of 1,024 x 600 and high details only 14.7 fps is possible. Crysis: At a 1,024 x 768 resolution (on an external monitor) the netbook could only manage a frame rate of 15 fps (CPU) or 19 fps (GPU). However, the first-person shooter can be reduced to 800 x 480 pixels; at this resolution the Crysis CPU/GPU benchmark runs at 24 fps (CPU) and 26 fps (GPU). So Crysis is playable, but only to a certain extent. World in Conflict: This real-time strategy game failed with our standard benchmark settings (1,024 x 768, low details), reaching only 6 fps. But there is an even more frugal option of ‘very low’ details and 800 x 600 resolution. With these settings the graphics benchmark runs at 28 fps (DirectX 9). But in the Aspire One 521’s native resolution the gameplay slips back to an unplayable 12 fps. Far Cry 2: This first-person shooter proved to be too much for the HD 4225 - at 16.5 fps it was unplayable. We had already chosen the lowest resolution (640 x 480) and low details (DirectX 9). 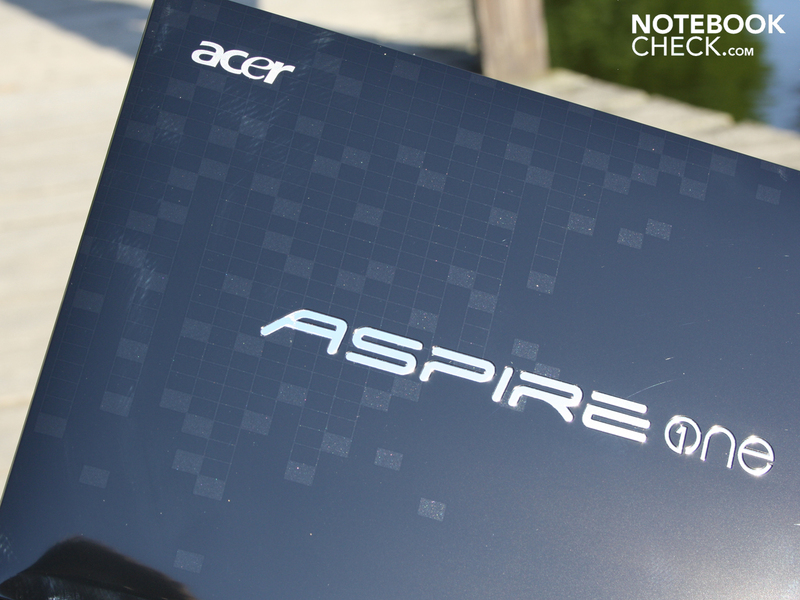 Gaming summary: We are not trying to claim that the Aspire One 521 netbook is suitable for gaming. But users are certainly better off than they are with Intel Atom systems, which can barely play any mainstream games that are even remotely modern. Nvidia Ion (I + II) should provide slightly better graphics performance, but we could not test this fully. Three out of four games that we tried out were playable on their lowest detail and resolution settings, which speaks in the AMD netbook’s favour. 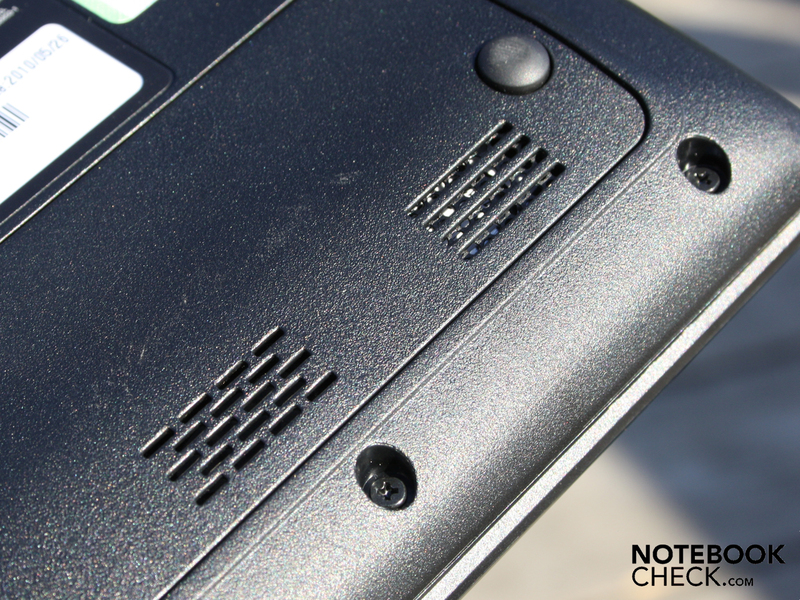 The Aspire One 521’s fan was our constant companion. It did switch itself off occasionally when the netbook was idle (30.3 dB(A)), but at the slightest sign of activity from the user it stays on continuously (32.1 dB(A)). This is in contrast to Pine Trail netbooks, which switch off the fan for long periods of time (Samsung N150) or even better do without one altogether (Dell Inspiron Mini 1012). We did not find the even murmur of the fan to be annoying at all. Office tasks or listening to music is accompanied by a noise of 32.1 dB(A) at most from the fan. However, it can get rather irritating during heavy use. A 3DMark06 test brought the system noise up to 34.4 dB(A), with fluctuations down to 32 dB(A). A stress test that put an equal strain on the CPU and GPU (100% usage) increased the speed of the fan and brought the volume level to 35.4 dB(A). The low energy usage (6.7 Watts) when idle suggests that the netbook will not warm up unduly. During office use the top of the base unit did not exceed 30°C; the warmest point is the left-hand palm rest area. When the netbook is idle with no activity at all, the temperatures sink to an average of 27°C (top side) and 28°C (underside). During heavy use (the stress test) the situation changes, but not drastically. The warmest part of the bottom of the machine is the area above the heatpipe and air vent (41.5°C). 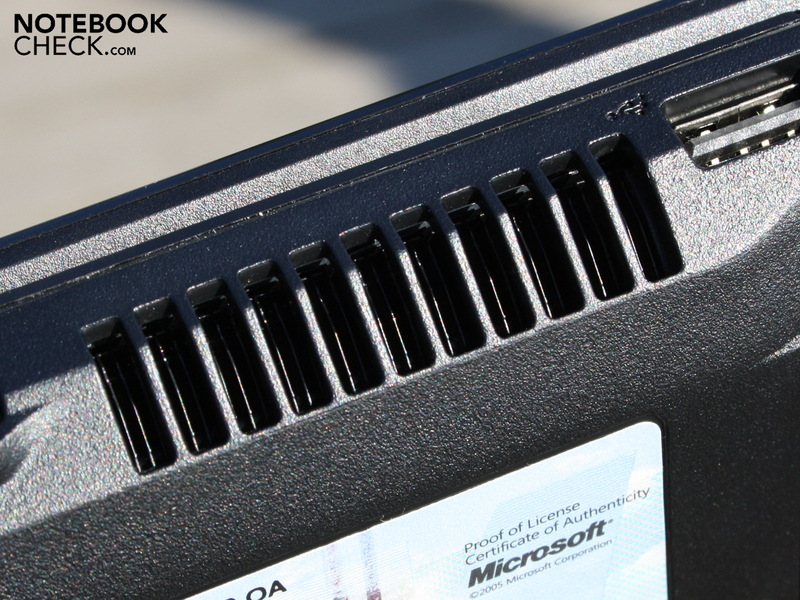 As the average is only 32°C, the netbook is unlikely to become uncomfortable on your lap. And it should be stressed that this high temperature on the underside was reached by using an artificial stress test which lasted several hours. Normal everyday use will rarely produce 100% CPU usage like this. (+) The average temperature for the upper side under maximal load is 30.3 °C / 87 F, compared to the average of 29.8 °C / 86 F for the devices in the class Netbook. (+) In idle usage, the average temperature for the upper side is 27.2 °C / 81 F, compared to the device average of 29.8 °C / 86 F.
The quality of the sound emitted by the stereo speakers is acceptable but not especially good. They are positioned at the front of the underside of the netbook and send their sound down towards the desk. This does not sound particularly effective, but there is method in it; the desk surface reflects the sounds waves which spread outwards evenly through the room. But if the netbook is not sitting on a desk, the sound gets lost somewhere, and seems unbalanced. The sound quality has too much of the middle frequencies, and no bass at all due to the lack of subwoofer. The usual SRS sound options are not available this time. We could activate Virtual Surround sound but could not hear any improvement. 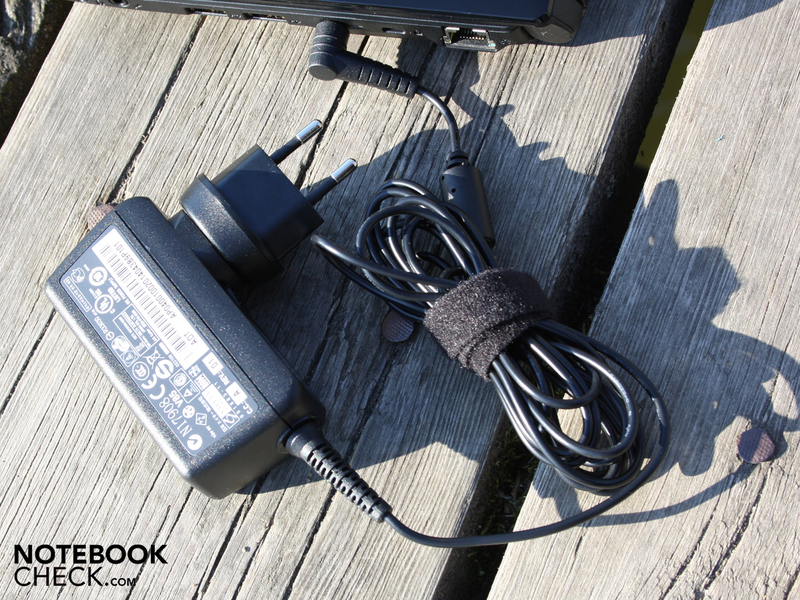 External loudspeakers can be attached via the headphone socket (no optical SPDIF). In a simple test, the sound seemed to be free from any crackling. Battery run time is important for a netbook, and until now it has provided the strongest argument for buying Intel-based machines. They can achieve anything from six (Asus Eee PC 1001P, Samsung NP-NB30, wireless test) to ten hours (Acer Aspire One 532, Asus Eee PC 1008P, wireless test) as a matter of course. 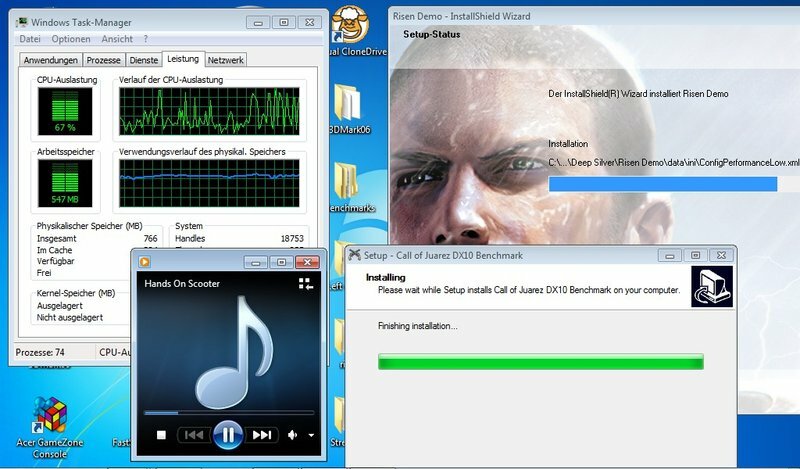 Even Nvidia Ion netbooks (Samsung N510, 279 minutes) are in the same area with just under five hours. So the well-informed buyer will have high expectations. AMD does not disappoint, coming in slightly ahead of the aforementioned Ion netbooks from Samsung - 295 minutes in the wireless test, which is 4 hours 55 minutes. To our delight, the 10.1-inch machine lasted 5 hours 36 minutes when playing a film from the hard drive (not H.264). The screen brightness was 100 cd/m² throughout and the wireless mode was disabled. Under heavy use (Battery Eater Classic test) the run time was 168 minutes, 2 hours and 48 minutes. The wireless was active during this test and the screen brightness was set to max. Curiously the battery lasted only 5 hours and 21 minutes in idle - only a half hour more than during the wireless test. We repeated the test but got the same result of 321 minutes (with the battery running down at a constant rate). 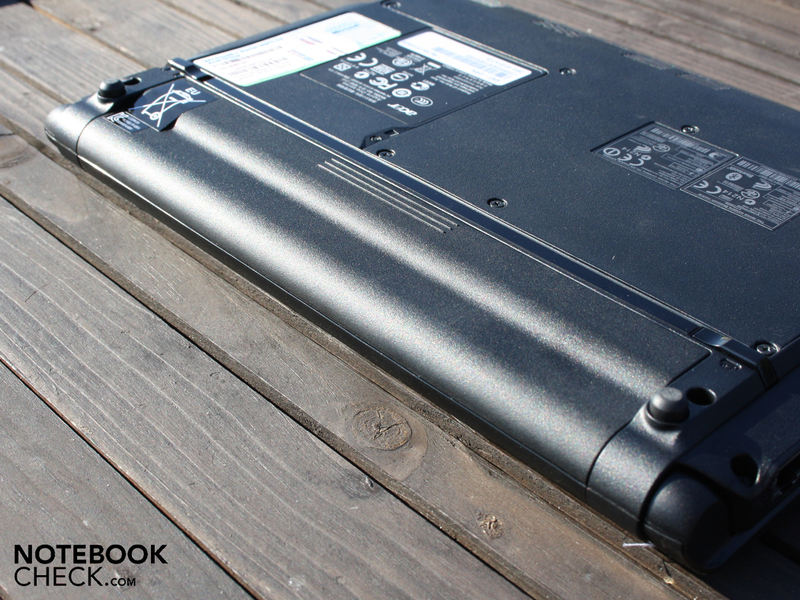 So the energy-efficient but much weaker Atom netbooks still win when it comes to battery life. Intel’s Pine Trail platform in particular has a lot going for it, but the Aspire One 521 with its AMD hardware is not far behind, offering five hours of battery life (wireless use). It is especially impressive given that it is only a 4,400 mAh (48 Wh), six-cell battery in this review model. 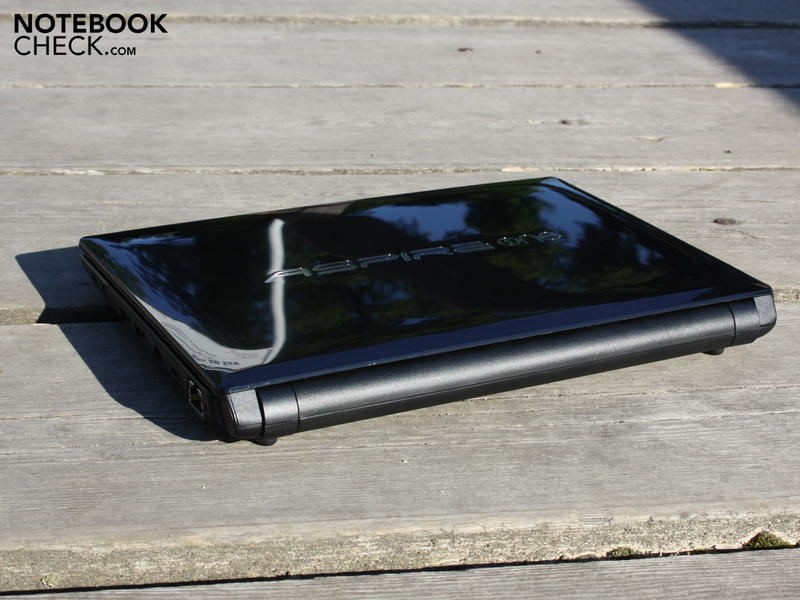 If you are not looking for the ultimate in long battery life, the AMD netbook could be just right for you. With battery run times like these we were expecting very low energy consumption in idle. Our multimeter confirmed this, showing 6.7 Watts. 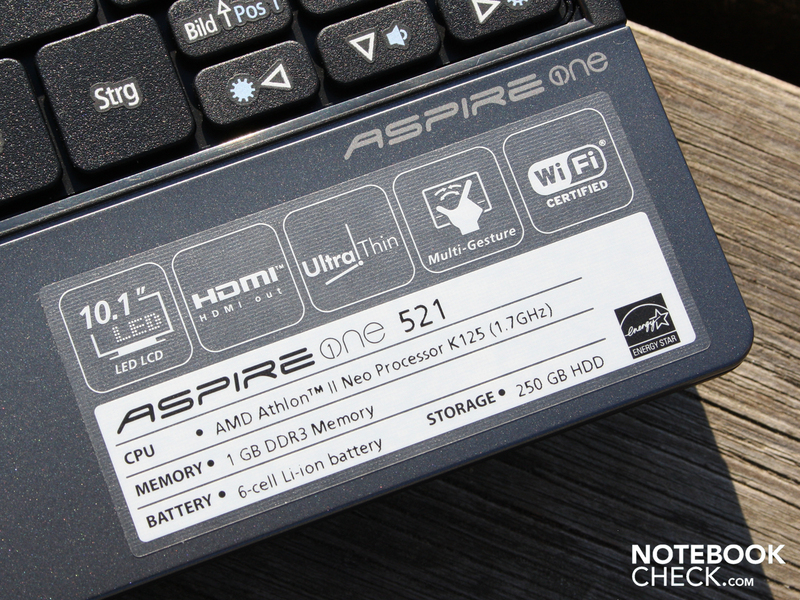 However, the Aspire One 532 (with the Atom) is even more frugal at 4.5 Watts. If you are surfing the net and writing emails, you can expect an average consumption of 12 Watts. The mains adaptor is designed to handle 40 Watts; this is sufficient for the maximum energy consumption of 25.4 Watts, and leaves some space in reserve for charging the battery. 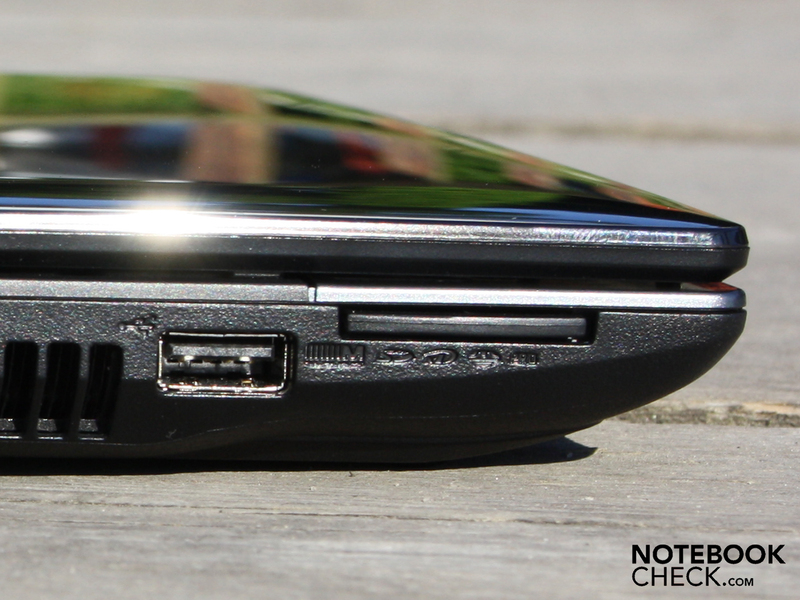 The Aspire One 521 takes a long time to recharge - 2 hours and 42 minutes. Finally - an AMD-based 10.1-inch netbook with battery life approaching that of the Intel Atom netbooks. 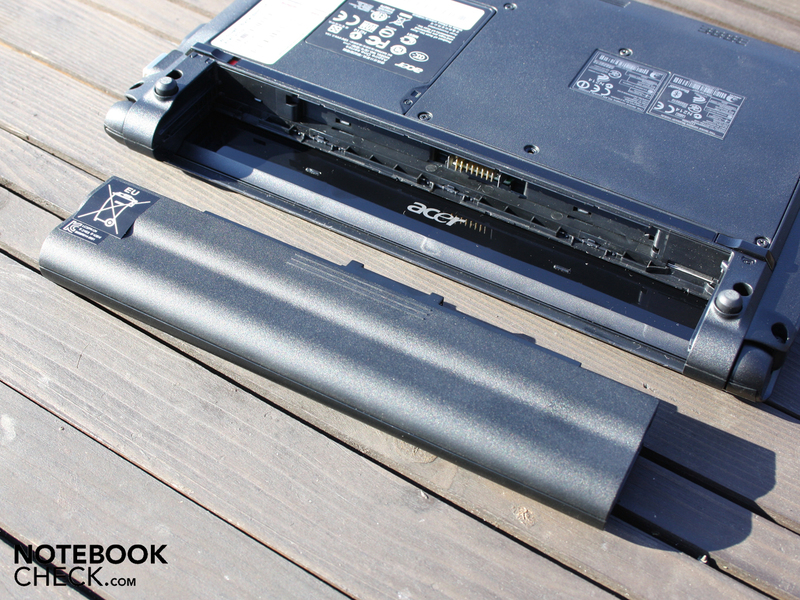 Acer is marketing the Aspire One 521 with its Athlon II Neo system as a netbook, and we are also keeping it out of the subnotebook category. 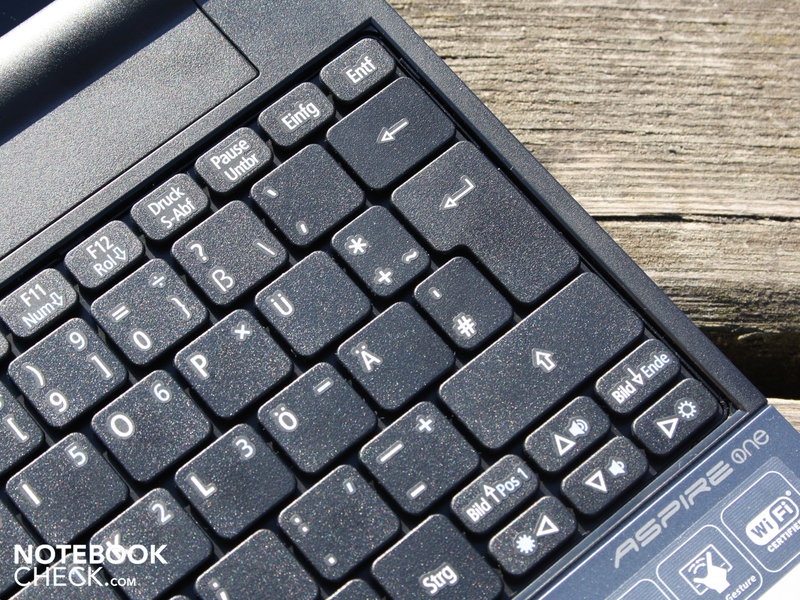 For €329, the Aspire One 521 outshines every Pine Trail netbook (battery life aside). The performance is much better, and Windows 7 Starter feels fluid for the first time. The ATI HD 4225 in AMD’s Nile platform decodes HD video content and allows you to output HDMI video and audio signals to a television. 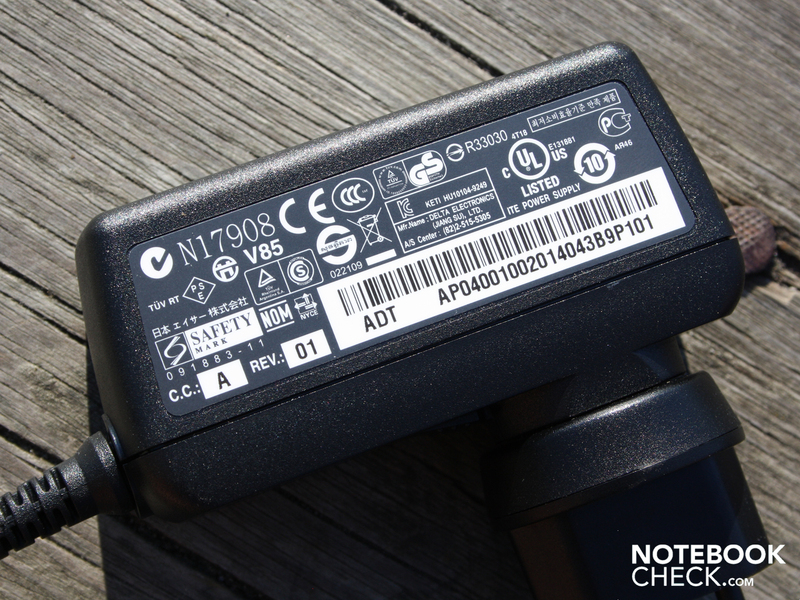 The battery life does not reach the dizzy heights of 6 to 10 hours, as Intel’s Atom netbooks have done. But with around 5 hours of use and the performance level of a single-core subnotebook, the user should be more than satisfied. The case also has an extremely robust construction, as does the lid, although greasy fingerprints accumulate on the glossy surfaces and this starts to get irritating after a while. The netbook’s biggest flaw is that its WSVGA screen is not HD ready, with a resolution of only 1,024 x 600. Watching 720p films from the internet would be more enjoyable if it were, and the clarity of the picture would be better. 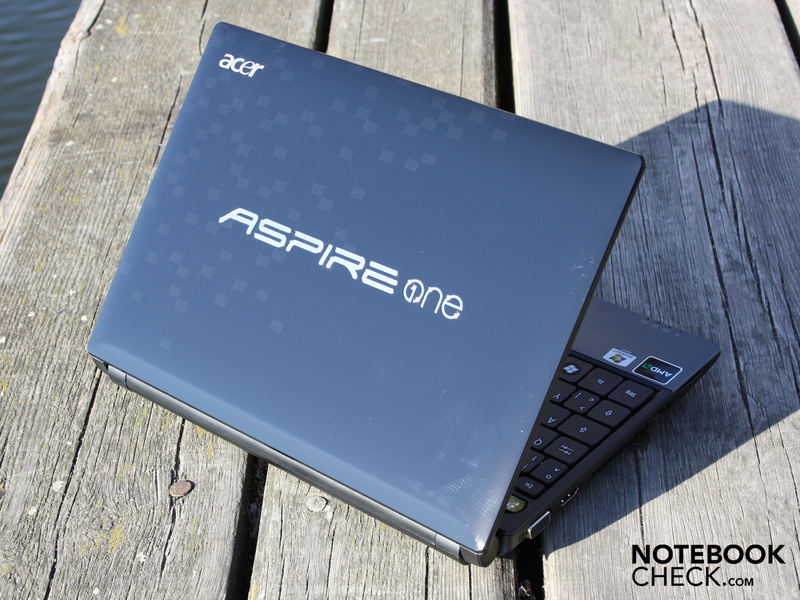 The Aspire One 521 is currently without competition in terms of performance for its size. This level of performance has previously only been seen in 11.6-inch machines or above. Nvidia Ion (I & II) systems are only available in 11.6-inch (e.g. Samsung N510 and 12-inch (Asus Eee PC 1215N) machines. The 10-inch Acer Aspire One 532g (Ion II) has been scrapped according to the latest rumours, and the Eee PC 1015N does not yet have a release date. 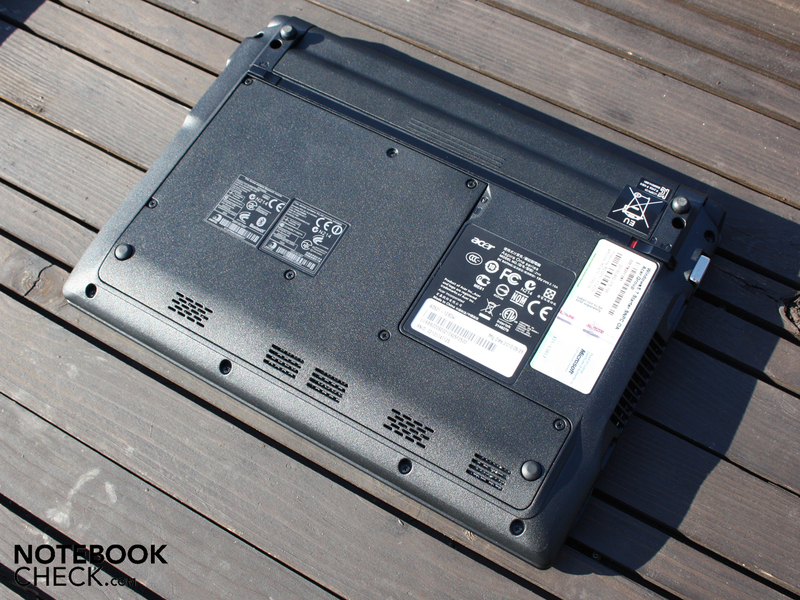 With this in mind the price of around €329, only €40 more than most popular netbooks, is very attractive. We can certainly recommend buying this. the 6-six battery (4,400 mAh) can be removed. Underneath you can see the preparation for a Sim card slot. The large cover gives you access to all upgradable components. and here is one of the two loudspeakers. 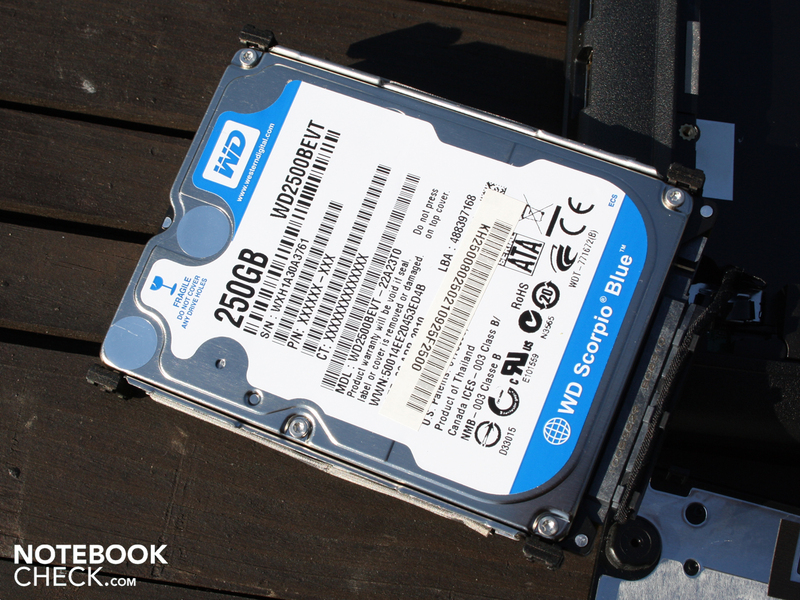 The 250 GB hard drive by Western Digital is very quiet. but with 55 MB/s in sequential reading it is comparatively slow. 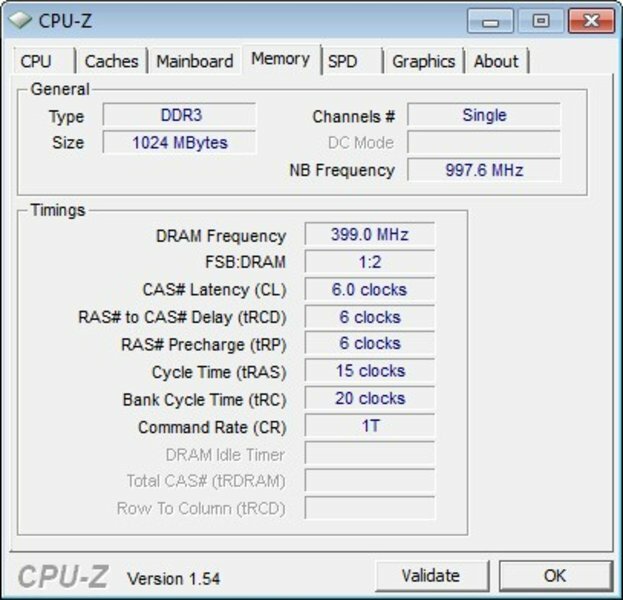 DDR3 RAM - unusual for a netbook. 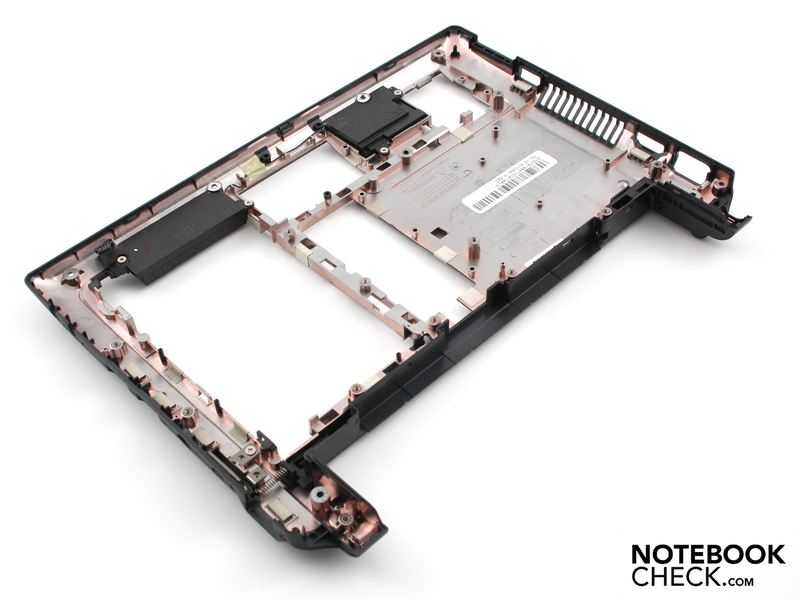 Here you can see the heatpipe belonging to the cooling system. is designed to handle 40 Watts. Despite the powerful hardware, battery life is respectable at around 5 hours. Or is there? The ATI HD 4225 graphics processor allows HDMI video output. is not a netbook like any other. AMD technology has been used instead of Intel. 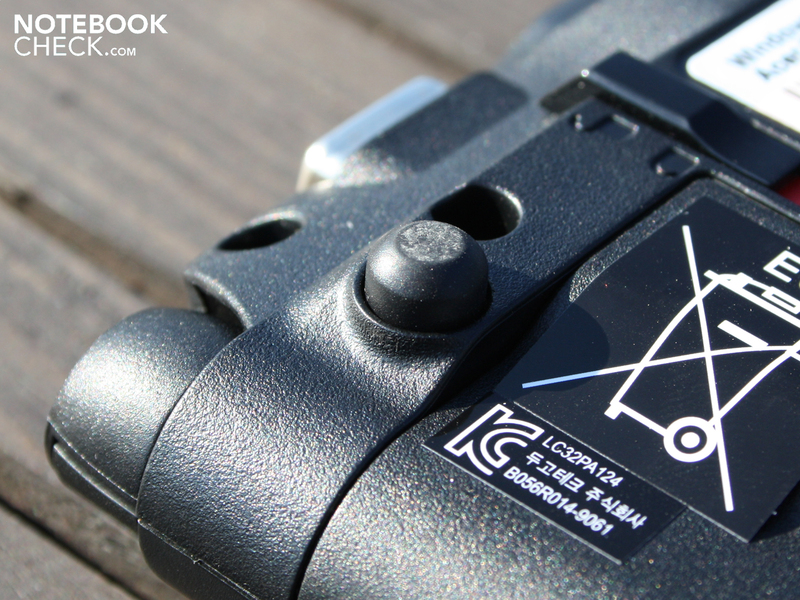 It is equipped with the Athlon II Neo K125. The same goes for the robust case. We could not even bring the underside to flex at any point. or the high-resolution 1.3 MP webcam. It also has a card reader slot (for memory cards). and tiny laptop feet. Nothing unusual here. 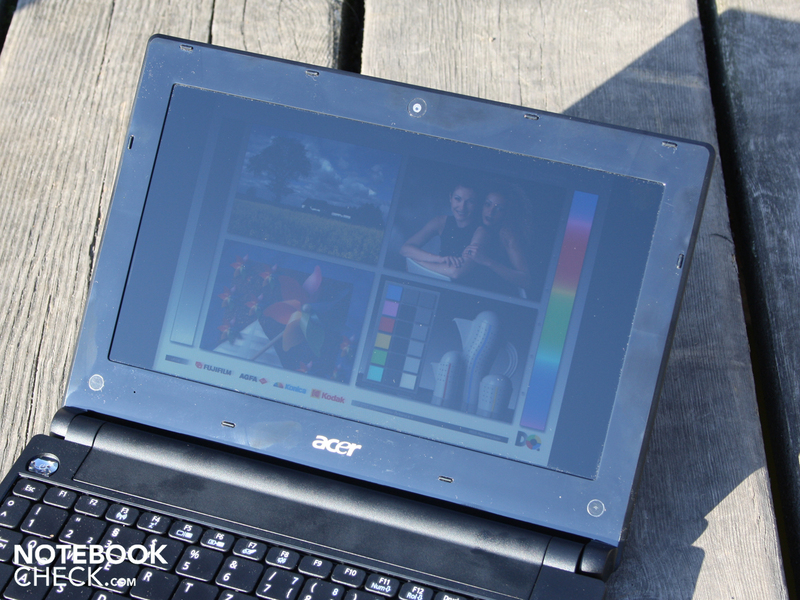 The Acer Aspire One 521: recombining performance and portability. AMD is back in the game. With improved performance and good battery life, the AMD platform has overtaken the Intel Atom. A stronger battery (nine-cell) with staying power could have properly beaten Intel’s netbooks, or many of them at least. The mobile Phenom cores based on K10 architecture did not convince us, but their smaller brother the Athlon II Neo has managed it effortlessly. Pine Trail is too weak to compete, so we will refer you to Nvidia Ion and small subnotebooks in the 11.6-inch format: Acer Aspire 1410 (Celeron Dual Core SU2300) from €430, with Celeron-M 743 from €390; Acer Aspire 1551 (Turion II Neo X2 K325) from €500; Acer Aspire TimelineX 1830T (Pentium U5400) from €550; HP Compaq Mini 311c-1010eg (Nvidia Ion) from €340, Samsung N510 from €370.